KATHMANDU, July 21: Stocks opened the week posting strong gains ahead of the start of the Fiscal Year 2018/19. On the first two trading sessions, the Nepal Stock Exchange (Nepse), which opened the week at 1191.98 points, climbed more than 20 points. Nonetheless, the index recorded losses in all latter sessions. 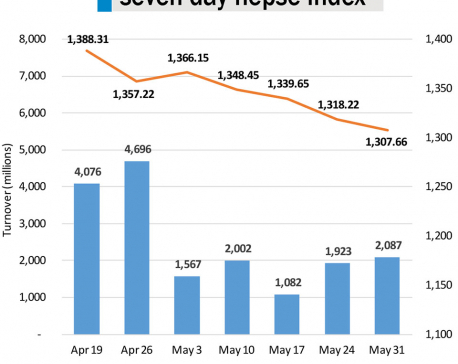 Consequently, Nepse added a meager 1.41 points to close the week at 1,193.39 points. The beginning of the fiscal year mid-week failed to uphold market sentiment. The bourse experienced dismal trading sessions over the review period following a lack of any significant impetus that could boost investors' morale. 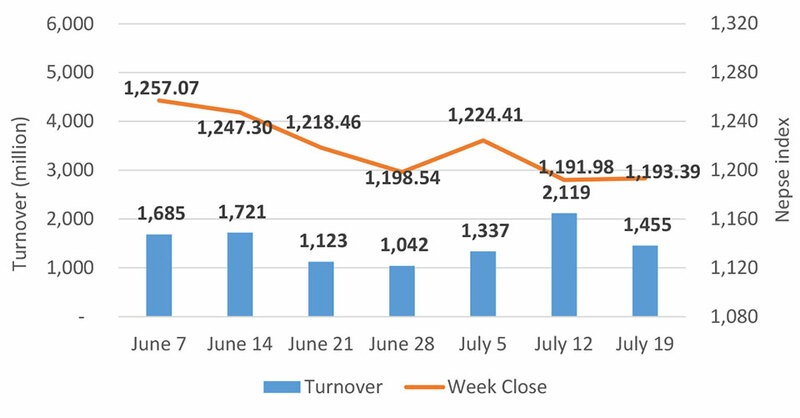 As a result, weekly turnover decreased by over 31 percent week-on-week to Rs. 1,455 million. Class 'A' stocks edged slightly higher with the Sensitive Index eking out a gain of 0.37 points. Similarly, most of the major-sub-indices posted modest moves to the upside, except Microfinance sub-index which slumped 1.66 percent. Hotel sub-index logged in the highest advance of 1.94 percent. Similarly, sub-indices of trading and finance sectors also closed higher by 1.09 percent and 0.87 percent, respectively. Development bank and banking scrips also ended the week in the green. Among the active scrips, Prime Life Insurance Company Ltd promoter share registered a total transaction of over Rs. 358 million in the week. Banking stocks followed suit as Nabil Bank Ltd and Nabil Bank Ltd promoter share were also actively with turnovers of Rs. 131 million and Rs. 43 million, respectively. Other top turnover stocks for the week include Nepal Investment Bank Ltd, Nepal Insurance Company Ltd and Nepal Life Insurance Company Ltd.
After the end of the Fiscal Year 2017/18, the earning season has kicked off with First Microfinance Laghubitta Bittiya Sanstha reporting an increase in net profit by 27.43 percent year-on-year. Meanwhile, other companies which have published fourth quarterly reports including Shrijana Finance Ltd, NMB Microfinance Bittiya Sanstha Ltd and Laxmi Laghubitta Bittiya Sanstha Ltd have reported decline in their respective net profit compared to the corresponding quarter last year. This week more than six million unit shares were listed in the exchange. Among others, the listing includes over three million unit bonus and right shares of Nepal Insurance Ltd and over one million unit bonus shares of Forward Community Microfinance Bittiya Sanstha Ltd.
ARKS technical analysis model indicates that the market remained in the consolidation phase throughout the week as the index gyrated between a narrow range around 1,200 points mark. Despite the index rallying initially, the index pulled back to close the week essentially flat. Relative Strength Index (RSI) has descended slightly towards the oversold zone and Moving Average Convergence/ Divergence has continued to hover in the negative territory. This suggests that there is still an absence of noteworthy momentum to drive the market higher.